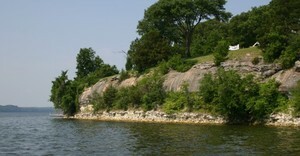 Grand Lake O’ The Cherokees was created in 1940 with GRDA’s completion of Pensacola Dam. It is one of the premiere lakes in the Midwest and the crown jewel of a chain of lakes in the northeastern Oklahoma region. Its 46,500 surface acres of water are ideal for boating, skiing, fishing, swimming and sailing. In fact, the lake, which lies in a southwest to northeast direction, is popular with sailboat enthusiasts wishing to take advantage of the prevailing wind. Normal surface elevation is 742 feet above sea level. With 1,300 miles of shoreline meandering through the foothills of the Ozark Mountains, everything from bustling lakeside communities to quiet secluded coves and lakeside resorts can be found along its shore. Grand is consistently ranked among the top lakes for bass fishing in the region and is also a haven for migratory waterfowl and other wildlife. For rules and regulation on Grand Lake please visit the GRDA Police page. For a copy of the Grand Lake Shoreline Management Program, visit the SMP page. For a copy of the Grand Lake Information Map, visit Grand Lake O’ the Cherokees Map page.